And for years, she's wanted to ride a MOTORCYCLE. Which is something you should really check off your bucket list BEFORE you pass the century mark. So she figured she'd never do it. But last week she was talking to her dentist, who's a big motorcycle guy. And he offered to take her for a ride on his HARLEY. It's a two-seater, and the back seat has a thing you can lean back on. So she was pretty secure, and didn't have to hang onto him. He put her in a helmet and an oversized leather jacket, and they drove about 15 miles before they headed back. The best part is he picked her up and dropped her off right outside her retirement home. So all her friends got to watch from their windows. 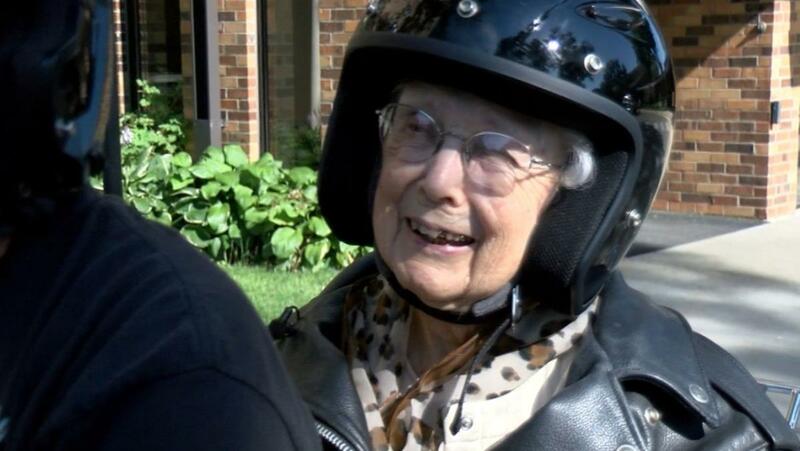 She told the local news that she completely forgot how old she was while she was out there. The only part she didn't like was they couldn't talk, because it was so loud.